If you are looking for something a bit different from the standard common wellie boot, a pair of lace up rain boots might be the answer. There are plenty of different styles and colors available from tall elegant dressy boots to cute and colorful waterproof sneakers. The advantage of laced boots is that you can tighten up for the perfect fit where as regular waterproof boots can be either too tight or too slack. High quality wedge heel lace ups from Scandinavian designer Ilse Jacobsen. Available in three stylish colors – Grapeleaf, Phantom and Cabernet. Dirty Laundry Laced Wedge Rainboots. 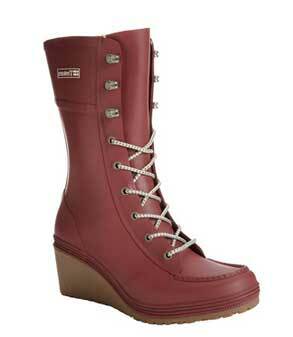 If your a girl who loves her heels then these waterproofs might be the perfect buy. Available in seven cool colors – cobalt blue, black, steel, purple, fuchsia, turquoise and green. One of our favorite styles. Ribbon Laced Ankle Rain Boots. 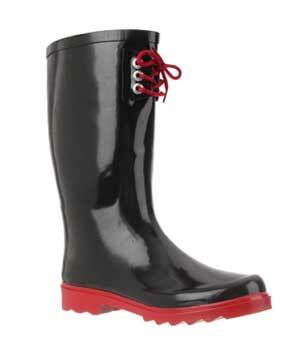 These rubber jelly boots are bang in fashion at the moment. They are quite inexpensive but still look really fresh and fun. Pair them up with funky socks to create some really cute looks. If you style them right these wet weather ankle booties will look fab on even the most miserable of days. Available in four different designs. 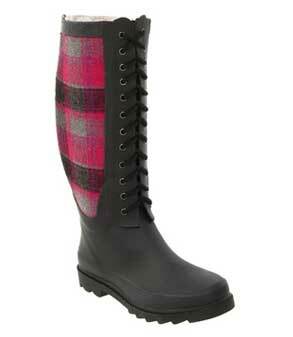 Strawberry colored plaid wool patterned side panels and cool front lace ups give this boot a unique and stylish look that will compliment any number of rainy day outfits. Thumbs up from us. 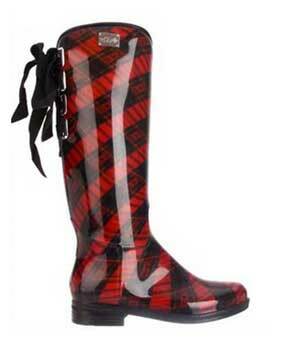 dav Luxury Eve Red Plaid Wellingtons. 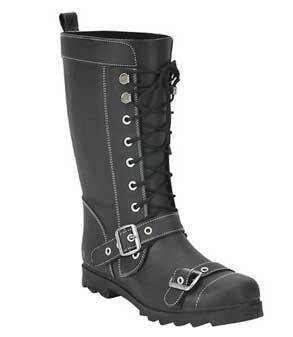 These waterproof boots from dav are elegant and stylish enough to be worn with a more dressy outfit on any occasion. These military style chunky wellingtons look tough but are a super cute option women looking for a rain boot with attitude. 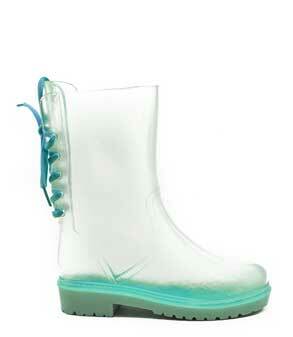 These funky transparent rainboots have novelty style rear lacing and come in a cool collection of flavors – pink, clear, black, yellow and aqua. Western Chief Women’s 3 eyed laced waterproofs. 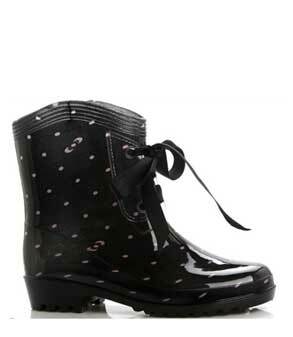 Glossy wellingtons with pretty 3 hole lace decoration. Available in red and blue. 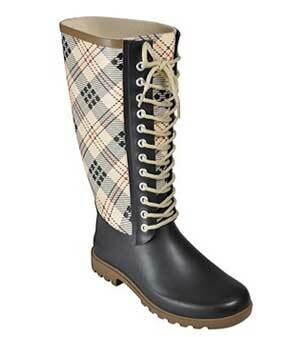 Stylish front lacing plaid print rubber boots. Available in three different designs. 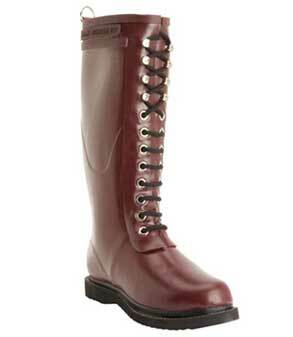 Laura Ashley Elegant rain Boots. 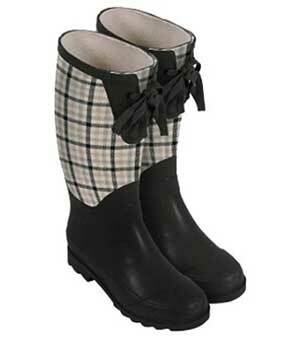 Black Rain boots with stylish plaid uppers and finished with pretty bows. From icons of British design Laura Ashley. 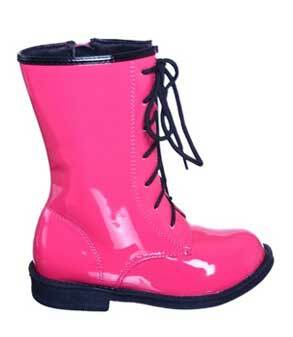 Girls Hot Pink rubber Lace up Boots. Patent laced ankle military style weather proofs. If these bright pink beauties are a bit too loud for you they are also available in black and white. Absolutely adorable rainy day sneakers. 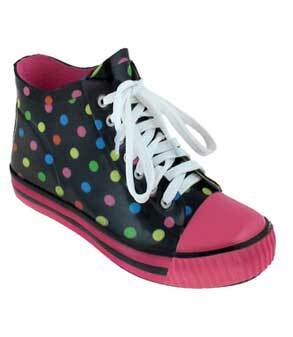 Keep comfortable and dry with these cute polka dot trainers. 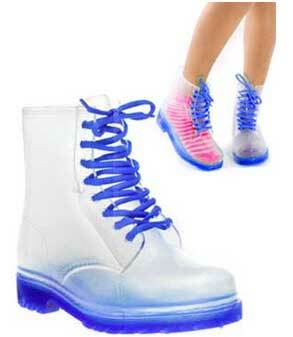 Elegant lace effect waterproof boots. 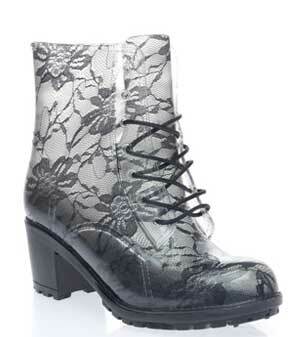 Delicate lace print boots to add a bit of class to a rainy day outfit. 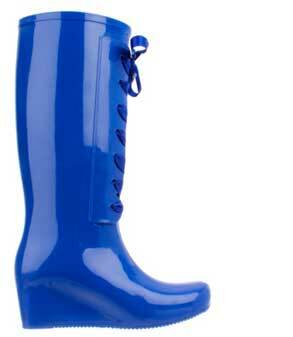 High quality wedge heel rain boots. available in three stylish colors – Grapeleaf, Phantom and Cabernet. High quality wedge heel lace ups. available in three stylish colors – Grapeleaf, Phantom and Cabernet. 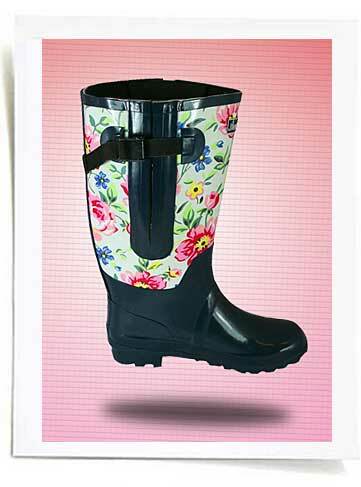 Extra big calf floral wellies from wide calf specialists Jilleon. Fits up to 20 inch calves.